You'll need 6 wooden skewers (6 inches long each). In a blender, combine the yogurt and dulce de leche together. Reserve in the fridge. Then place four pieces of fruit on each skewer. Serve drizzled with the sweet yogurt dip for a simple dessert or separately for easy snacking. If you like, try making the dip with yogurt and chocolate-hazelnut spread instead. Now that the heat has finally arrived, I like to prepare fast snacks that are easy and fresco for this season. Our favorite recipes during spring and summer are fruit-based dishes. 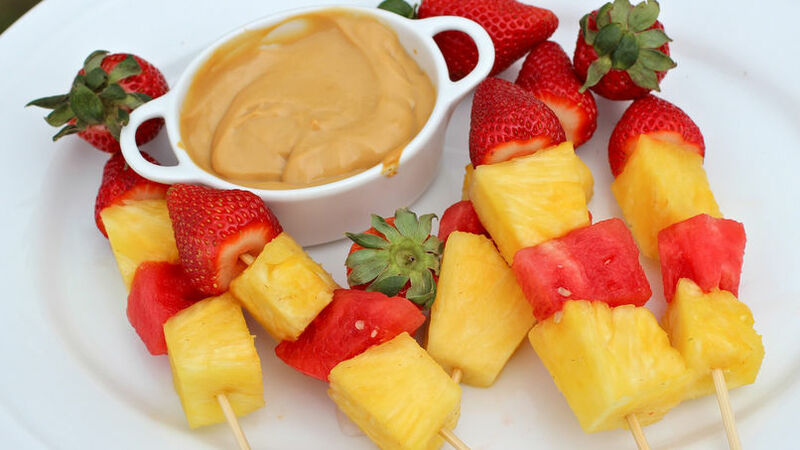 Today I'll show you some fruit skewers with a dulce de leche dip that my kids think are wonderful. You can serve these at any children's party, your own barbecue or just for a night-in with a movie. These treats come in handy on last minute notice and go easy on your budget, besides being simply delicioso. Best of all, you can leave some prepared in advanced. Keep refrigerated and covered with plastic until ready, and don't forget your favorite fruit!